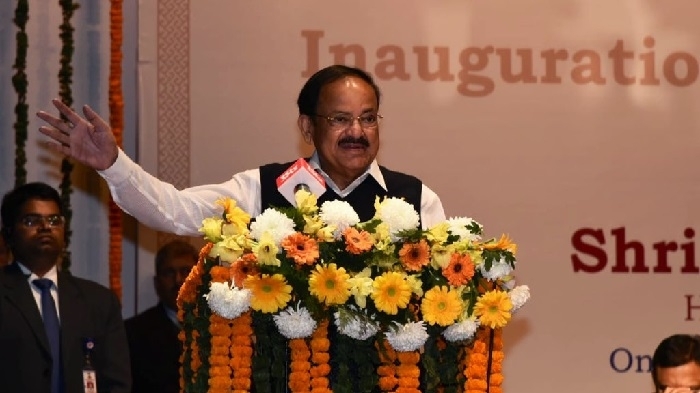 New Delhi, Jan 28: Expressing concern over the lacking life skills among youth, Vice President M Venkaiah Naidu said that solid steps should be initiated to address the problem faced by the youngsters. Addressing the gathering on the occasion of Platinum Jubilee Celebrations organized by Andhra Association New Delhi, Naidu opined that youngsters instead of taking stress should be able to enjoy Learning. He further added that students should not feel learning as an unwanted activity. The Vice President also urged teachers to revisit existing syllabus and teaching methodologies. Stressing upon the need of other activities apart from regular studies, the Vice President stated that teachers and concern stakeholder should focus on schooling hours outside their classrooms. Naidu suggested that outdoor activities like Gardening, sports, and PT should be incorporated with the routine activities. On this occasion, Naidu showered prises on Andhra Association for engaging vital activities in the education and healthcare sector. In order to strengthen the health care sector, he urged private players, civil society organizations and NGOs to team up with the central government.